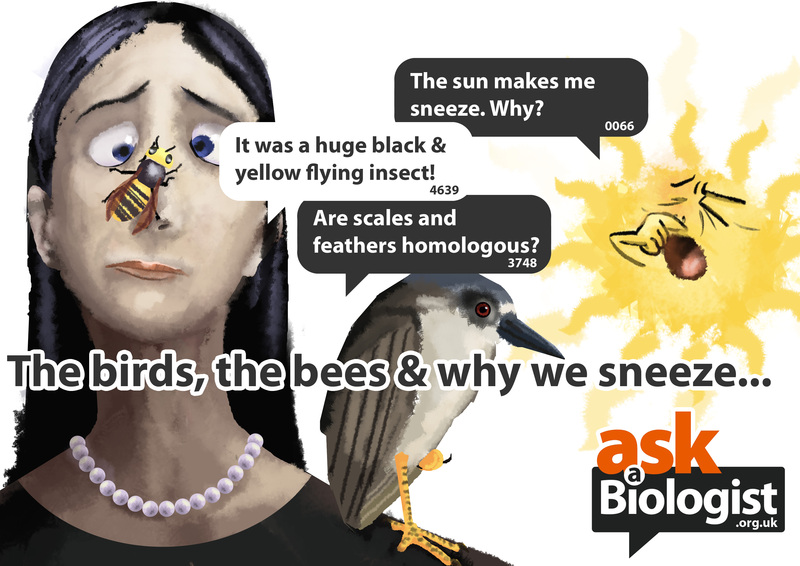 Some time ago I alerted people to the need for Ask A Biologist advertising material and that the Art Evolved guys had kindly asked their contributors to pitch in. In all the tyrannosaur kerfuffle I hadn’t overlooked the fact that the first one has been submitted. David Maas (to whom I now owe much alcohol) has sent in this superb effort that combined everything I was hoping for, it’s simple, clean, bright and fun and get’s the point across wonderfully. My thanks to him and I’m hoping for many more. Awesome effort. Are the numbers in the speech balloons the number of the Q from the site? And does that therefore mean that the Q about sun-triggered sneezing was the 66th Q to be asked? Thanks. As an aside, once I had noticed that a bright light would sometimes cause me to sneeze, I have used that knowledge when I’ve had one of those almost-sneezes that then usually peter out anticlimactically. I’ve found that a 25 watt incandescent lightbulb is sufficient to get me past the trigger threshold and, by alternatively looking away and then directly at it, can get often three or more good sneezes out of it.